“Mommy and Me” clothing collections are common enough, but “Daddy and Me?” Why shouldn’t fathers and sons get a piece of the matchy-matchy action too? At TheGeneration, paternal types can pick up a pair of handmade slip-on shoes for themselves and a coordinating set for Junior. Perfect for vegan dudes big and little, the classic kicks are made from hemp, linen, and organic cotton and come with hand-stitched fabric soles that dispense with potentially toxic glues. "Mommy and Me" clothing collections are common enough, but "Daddy and Me?" Why shouldn't fathers and sons get a piece of the matchy-matchy action too? 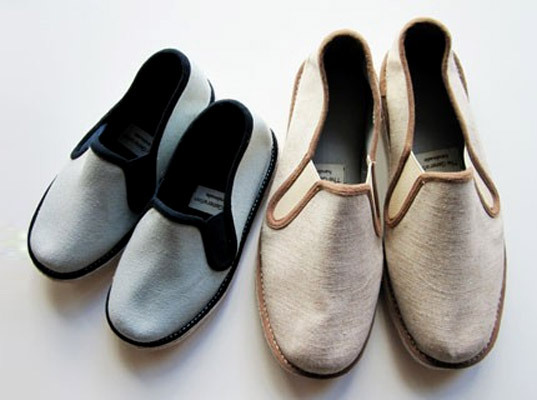 At TheGeneration, paternal types can pick up a pair of handmade slip-on shoes for themselves and a coordinating set for Junior. Perfect for vegan dudes big and little, the classic kicks are made from hemp, linen, and organic cotton and come with hand-stitched fabric soles that dispense with potentially toxic glues.